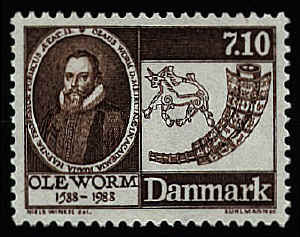 Ole Worm, a Danish academic active in many fields found many runic artifacts. Among them is the Tullstorp stone from Skåne, Sweden from the 11th century, on which is a lion-like animal. The horn is also engraved with runic ornaments. Öland, just south of Gotland in the Baltic Sea, is the second largest Swedish island. 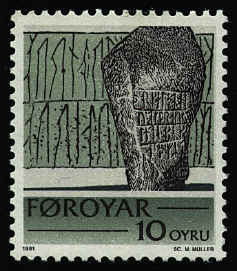 The rune stone on the stamp below is from the 11th century. It is at the Köping church. Two serpents with runes border the stone . 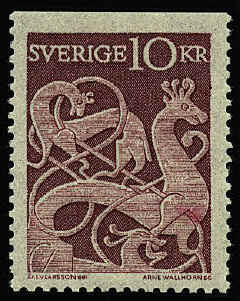 A third serpent can be seen at the bottom of the stamp biting the leg of the large animal (perhaps a deer or elk). The style of the carving is reminiscent of the carving of the Urness portal (see http://sio.midco.net/danstopicalstamps/runestones.htm#2 ), also from the late 11th century. Characteristic of the Urness style are the spiral hip, animals biting each other, and the large (sometimes almond shaped) eyes. The Alstad rune-stone was raised by Jorun in memory of Ol-Arnir. 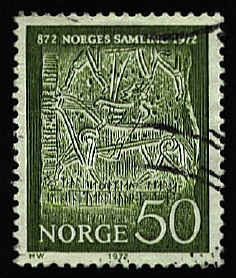 It shows a horseman with runic inscriptions below and on the left side. The horseman is interpreted by L. Jacobsen, Evje-Stenen og Alstat-Stenen, Oslo, 1933, p. 30, as Högne, the murderer of Sigurd. A later inscription was added by a certain Igle to commemorate his son, Thorald. Three rune stones have been discovered in the Faroe Islands. Shortly after the church in Sandavágur on the island of Vágur in the Faroe Islands was consecrated in 1917, a rune stone was discovered nearby. The stone was moved inside the church and now stands near the altar. The inscription dates from the 13th century. It reads "Torkjell Onundarson, an easterner from Rogaland, built first in this place." This is the stone in the foreground of the stamp. The runes in the background are from the stone unearthed at the site of the cathedral at Kirkjubour in 1832. It dates to about 1100, is only partially decipherable, and is preserved in the National Museum in Copenhagen. In 1362 Swedish nobles who had left fiefs in Finland took part in the election of a Swedish king, Haakon VI, Haakon Magnusson. Haakon was also king of Norway at this time. After his election he was hoisted up on the Mora stone so the electors could pay homage. The stone disappeared in the 15th century. 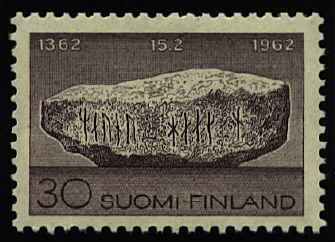 The stone on the stamp is the artist's re-creation of the stone with the two words, MAUNU HAAK N, Magnus and Haakon.